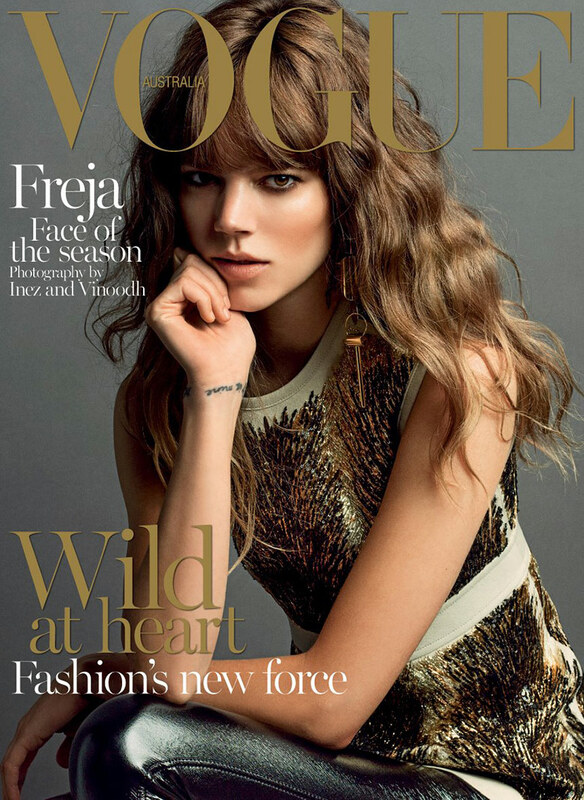 Freja Beha Erichsen is framed by Inez & Vinoodh for the cover of Vogue Australia September 2014. What a dream team! The Dutch star studded duo, Inez & Vinoodh are revealing their remarkable talents when delivering a flawless caption of the Danish supermodel Beha Erichsen. The Scandinavian hotshot embodies her tender and somewhat dreamy character given when taking on a casual sitting pose against a grey studio wall when lensed for the cover of Aussie Vogue. Graced in a glitzy outfit featuring a gold embellished top, slim fitted silver trousers and a statement earring, Freja is presenting her envious features including a deep smoky gaze, striking bone structure and a generous kisser, which are all enhanced with glamorous bronzing tones. Her natural brown mane has been enriched with romantic waves and is left to rest on her shoulders, fulfilling the effortless dainty look.